I want to let everyone know that the H20/Meth Target PID is not a conservative number. It is based on relatively dry air and having margin on AFR. The intent was to 1) help folks size their systems correctly. That's why it is not conservative. It is easier to tweak down with the controller, than jump up with a nozzle. And 2) to facilitate an understanding of H20/Meth injection. So here's a question, did I select the wrong setting somewhere or did you not change the units to our evil imperial system for the CACT and EGT pre DOC? It is set up for imperial units, psi, F, etc. In Torque's settings, under "Units" you can configure. Based on feedback, I've returned exhaust pressure to its previous form to match up with Testo output. DPF and Turbo Drive Pressure also follow suit. It is a very small adjustment, for the "tuning scientists". See attachment. I cant view EGT parameters in torque but can with BMWhat. Will using your pids let me view these additional parameters? Also, is there a danger it might brick my ecu as my car is a UK one? Works just like BMWhat. No problem. The file from this post did not show any PIDs for me. However, the file in your very first post works. Not sure if it's the file or my app. Ah, well that's just too damn simple. Never messed with torque before so I'm still learning the basics LOL. I've been spoiled data logging on vw/audi stuff with VCDS (similar to bav-tech). I hate to say it but the VW guys are just plain ahead of us. I am most jealous of the pressure sensing glow plugs - could really dial in water/meth will that. Wish someone would try to modify one of our glow plugs. Adapt a VW PSG to the 335d. There are 5 variants, none of which will fit without some sort of adapter/modification. Second option is to fit a pressure sensor to one of our plugs. Optrand makes a small affordable sensor that could be inserted into the body of a glow plug. I don't know the details of how either would be done, as I am in no position to make it happen. Then there is instrumentation, which is pretty straight forward. Simple voltage signal, but need a very fast data logger. A PC oscilloscope would probably be most useful from a tuning perspective. I can take care of that part of the project. We can start a new thread if others are interested in this. So far,I think it is just you and me. Connect it to the "dirty" side of the air filter and atmosphere and measure the "ram air" effect with speed. In the future, I maybe creating a pressure differential MAF PID, for those of you who are getting a clipped signal from the stock MAF due to increased boost and intake modifications. Not sure what the working pressure limit is. It may be able to measure pressure drop across an intercooler, or other fun things. I might try some of the other files. The reason is that the ECU in your vehicle is different than the US 335d ECU. You may modify the custom PID for Boost by changing the ID. Find "170" in the Boost PID and change it to "10B". "1" designates the OBD Mode and "0B" is the ID, as in the list above. Is that the full list of available IDs for my ECU? Is there an ID available on my ECU to monitor EGTs and oil temp? Awesome work on the PID's DWR. Now I just need some time to play with them! Let's start a thread. Looking at Optrand's site, they have the ability to insert a pressure sensor into a glow plug, but it renders the glow plug non-functional. This would be fine if you were simply wanting to use it for monitoring/mapping, but wouldn't be something I'd want to keep in. It would be interesting to see if we can adapt a sensor that will allow the plug to remain functional. Hey i modified the value and it worked in torque. However i think theres something different via my results and tdi. The boost was showing 14.6-8 at idle, which makes me believe it was including atmospheric pressure. Also it maxed out at 37 psi, which isnt correct as i was only half throttle, and could feel the car boosting more when the boost was already showing 37 psi. Do you think it may be my MAP sensor? To be honest, I really am not well versed in the European vehicles. I did some research to find your PIDs, but without having the vehicle ... any PID can be "calibrated" by changing the formula portion of the PID definition. You are probably right about the gauge being absolute pressure, but I cannot say that for sure. Please verify your ECU is a D73N57B0. Sorry, I can't be more helpful. I hope you can help me. 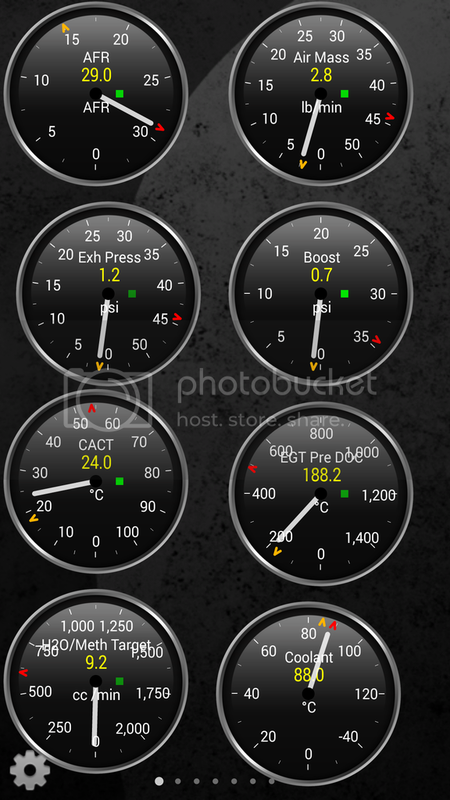 I am using BAFX adapter and Torque Pro app on my BMW X5 35d (2011). I purchase this combo primarily to have access to transmission temp. Other owner of 50i reported that he can access the temp. There are two "Methods" available in the app for the trans temp, but both are not working for me... The app states "no data". Please could you help to get the information on the transmission temp?